The Collected Interior: Affordable Media Room...Mood Board Design! 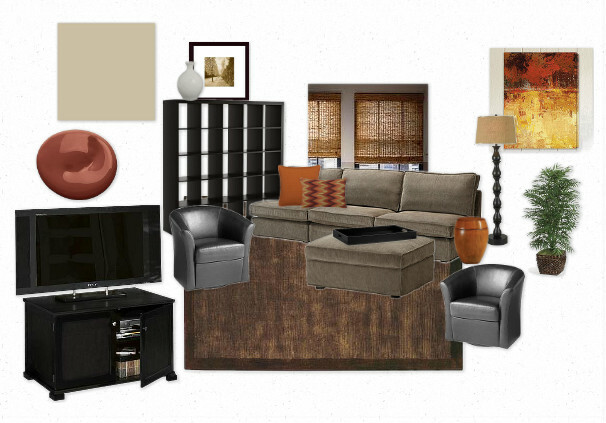 Affordable Media Room...Mood Board Design! You know the Media Room Craze that's happening it seems like everywhere these days? Yup, you know the ones...they've got wall sized movie screens and actual movie theater seating? Well here's a way to mimic the function and comfort of a Media Room...just on a smaller and way less expensive scale. I created this Mood Board below for a client who wants to turn their bland, catch-all bonus room into a sleek and functional Media Room. The kicker here is the client doesn't want to spend a ton of money because it's mainly going to be where the kids hang out...although Mom & Dad plan to catch a movie here every now and then. Amazing but all the main furniture pieces in this room (excluding art, accessories, blinds and tv) come to just under $2,100. The modular couch from Ikea is only $1100, and it's smaller scale is perfect for smaller spaces like bonus rooms. Click here to see all the options this modular line offers. The cubic bookcase is also from Ikea and costs just $199. The height of this case is only 72 inches. So I added a few accessories on top for added height and impact. The cool leather swivel chair is from Pier One. I love it's small size and that fact that it swivels...is perfect for a media room! See that 3 door console table to the left, with the chalkboard magnetic board above? That my friends will be the bar and snack area...so fun that the kids can grab a snack while watching a movie! What are your thoughts on Media Rooms? Are they way over the top these days or well worth the investment? I actually bought that modular sofa from Ikea for our basement TV room...oops...Media Room. It is actually standing up really well and the chaise feature is really fun for movie watching. The only reason I like the Media Room concept is that it designates the TV to a space...justifies my need for a library. I agree ladies...tv room, media room, living room - it's really all the same. We have a Media room upstairs in our house, and ya know it's just fun knowing that's our designated space for watching movies and playing video games together! I think a media is great and not wasting space at all!! Wish I had a extra space or room that I could do that. I loved your board. And the choices you made are fabulous!